Below is Marcie's Updates for 2011. 2010 and 2012 history & updates. January was a distressing month for Marcie. 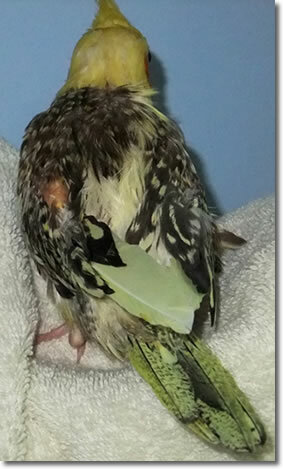 She did not require medical attention from Dr. Bob for any additional health issues, but the feather removal had been traumatic and stressful for her, so she was unable to gain weight. After the feather removal, some of the follicles were quite bloody and irritated, so I continued to apply the Gentamicin cream to the areas to aid in healing and prevent infection. New feathers began to appear after three weeks. At first, the new tail feathers were too fragile to remain in the skin and the tissue too damaged to hold them. She would grow feathers, they’d break easily, and I’d have to remove them since most were blood feathers. Then she’d grow a new set and the same thing would occur. This continued for several weeks until finally some emerged that were sturdier. Her new primaries (longest wing feathers) were more normal in size and better anchored than the first set that had come in. Evidently, the additional nutrition provided by the Lafeber Elemental Diet had contributed to her overall health. She began to try foods other than seeds during this time, finding scrambled eggs to be quite delicious. February brought with it a new issue for this precious little angel: some covert wing feathers, on the top of the wing, were being trapped just under the epidermis. Above these follicles, on the skin, hardened, round nodules were forming—the beginnings of feather cysts. So we returned to Dr. Bob. “We’re going to have to open those up and release the feathers,” he stated. That idea caused me great concern. First, she would be in pain throughout the procedure; next, she might become even more ill because of this, possibly from infection or skin damage; third, that there might be more of these incipient feather cysts, and finally that she’d lose whatever progress she had made. He always complimented me on her progress, saying, “You’ve done wonders with her. I didn’t think she’d make it, but now she’s coming along. It’s your nursing care that did it.” I was always pleased to hear that, but knew how little we had really accomplished, so didn’t allow myself to become too confident. He left the room for a moment to get a sharp, thin surgical blade. With this, he opened the epidermis, making three, small, precise incisions: one on each side and one across the center of the impacted area. He meticulously laid the tissue back and attempted to release the minute feathers. His technique was flawless. There were four of these incipient cysts. On two of them, he was successful in lifting the feather up and out of the skin. In two, however, it was unclear if he had accomplished his goal. He said he hoped they would stay out, but couldn’t be sure. They were so tiny I could barely see them. I held her, and she whimpered in pain. It hurt so much to see her in such discomfort. But she never tried to bite or escape. She simply endured. Too weak to fight, she rested her head on my hand and waiting for it all to be over. I couldn’t wait to comfort her and get her home. After he finished, he gently cleansed her tender skin with hydrogen peroxide to stop the bleeding and prevent infection. He informed me that I would have to open up any new ones that appeared and was to put the Gentamicin cream on these areas afterward. He instructed me on the technique so I could perform this procedure at home. I had no desire to do this to her, but I had no choice. I did what I had to do, but I didn’t possess his expertise. Nor did I feel satisfied with the results. I felt incompetent. After making the incision, I used hydrogen peroxide to clean and disinfect the area and then moved the tissue aside. I never did see an emerging feather, nor did I feel confident that I’d know one when I saw it, but hoped for the best. This was exceedingly stressful for her; fortunately, I was only required to perform this procedure twice. Her weight had been stable at 83 grams for several weeks, but this trauma caused her to lose several grams, going down to 75 grams. She could not afford to lose this weight, and at the end of the month she still had not regained it. The second time, before I incised the tissues, I administered Celebrex to alleviate the discomfort during and after the procedure. It did seem to provide relief from the discomfort. She didn’t experience as much depression, inappetence (lack of appetite) and sleepiness when first given the analgesic. Her weight had stabilized at 79, but hopefully she’d gain a few grams in the next few weeks. She had begun to eat Zupreem Fruit-Flavored pellets, a good addition to her diet. I was also placing her in a towel-lined bin at night for extra warmth and to prevent falls in her cage. The two xanthomas under her wings and the two on the elbow joints on top of the wings had been steadily shrinking. These areas are quite vascular, so working with them caused some redness and irritation. As the picture shows, the xanthomas under the right wing had diminished. The other three xanthomas would require more massaging to work them down, but they too were shrinking. As I massaged the xanthomas with the Gentamicin cream, they became soft, and the cholesterol-based tissue peeled off easily. The next day it again would be more friable, and this too would flake off with a little encouragement. Marcie was beginning to grow more stable tail feathers—finally! These and all her new feathers were emerging larger and more firmly anchored than their predecessors had been. I continued to syringe-feed her with the nutritional supplement and Glucosamine with Meloxicam. The joints on her toes were free of the granulomatous nodules. The end digits of her long toes remain curved, but that does not interfere with walking or standing. Her balance has been improving as well, although we are extremely careful to protect her from falls. 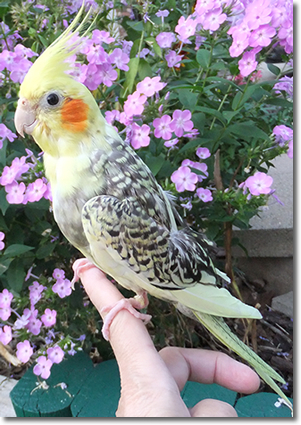 I had anticipated no fewer than six months for her body to begin to heal properly and no less than a year for her health to resemble a normal cockatiel’s. My estimate was proving to be correct. Her immune system was finally becoming stronger, and we were cautiously optimistic that her health would continue to improve. Although her weight had not surpassed 76 grams, and she continued to sleep frequently throughout the day, she looked and felt brighter, had a little more energy, and her appetite was consistent. We were pleased with her progress. At this point I don’t know that we could have asked for more. March was a very quiet month for Marcie, filled with progress. At last I believed she had indeed—finally—passed the last obstacle to her healing. She had developed no additional issues with her skin or feathers. In fact, the wing and tail feathers were growing in normally in size and length. The tail feathers in particular grew so quickly we could almost watch them grow! Unfortunately, she still had balance issues; so if she were to lose her balance, she would lean back on her tail. Not strong or well anchored yet, the feathers would break and fall out easily. The sweetness of her disposition remained unchanged; she was growing more delightful each day. Her curiosity was increasing, and she was exploring toys and spaces she had not been interested in before now. She would tenaciously hold her ground when another bird approached her, and she became more assertive when another bird moved into her space. She was bright, quickly catching on to being a member of the flock and finding her place in it. Although her appetite remained stable, she still hadn’t tried new foods, except for eggs. But she did show some interest in some other foods. Her weight had not risen about the upper 70’s; I have had to accept that this might be her normal weight. She was healing, growing feathers, and being more active. That’s more than enough. Confident that we were to have no more medical issues, I assumed she was nearly healed. But Marcie began showing signs of soreness and irritation under her right wing again. A moist, sticky, yellowish substance was seeping through the skin, as though it were edematous. I considered the possibility that this might be cholesterol breaking down and turning to a liquid. Dr. Bob once again performed a cytology test and found a return of the fungal cells. This was my fault. I applied so much cream under that wing that it didn’t have a chance to dry completely, thus allowing the fungal cells to return. Dr. Bob would say, quite satisfied with her progress. Her feathers were growing in rapidly now, and she was filling out. He put her back on Nyzoral and instructed me to apply an anti-fungal spray powder. This chilled her, so I alternated that with an anti-fungal powder. After three weeks on the medication and powders, Marcie’s wing tissues began to improve. After a few days, her tissues showed signs of healing. The left underwing area had completely healed and feathers were emerging. Her tail feathers finally began coming in and staying in! Hopefully, they would continue to grow normally. At this time, they were about an inch in length. Marcie was growing more curious with each passing day. She insisted upon seeing the world. She was also becoming more interested in her social life—engaging the other ‘tiels while eating and playing on the counters. She began joining in the contact calls with the other ‘tiels—a very good sign. She was enjoying playing with dried peas, tossing them around and digging them out of other toys. She’s discovered balsa wood toys and loved chewing on them. Of course, she still enjoyed our snuggling time, but even that became a little different now. In earlier months, she vehemently resisted having to leave her comforting place, but now she would inform me that she’d had enough and it was time to move on to other activities or rest. At the end of April, Marcie once again returned to Dr. Bob so that he could examine that right underwing. The tissue was still oozing. “You might be right--it could be cholesterol breaking down,” he remarked, “I’ve never seen that happen, but anything is possible.” He that the massaging I had been doing might have broken the molecules of cholesterol down sufficiently so that the body could reabsorb and eliminate them. Certainly that might have been true of the larger xanthomas, but now we were dealing with something quite unusual: cholesterol that was breaking down under the skin and oozing out. So he ran a cytology test on the tissue; it came back negative for fungal cells. The powder and Nyzoral had done their jobs. But what was causing the leaking? It should have stopped by now. He had me apply a liquid astringent, patting it under her wing several times a day. After it had dried, I was to apply the anti-fungal powder. Dr. Bob was quite pleased with her progress. He was impressed with her demeanor—her stance was straight and she had more energy. She was preening and moving about on the table. “She looks like a new bird!” he proclaimed. I’m so proud of Marcie—she never gave up. “She finally had a reason to live,” he commented. He held her for a moment and patted her head, but when she fidgeted, he returned her to me. For that one brief moment he held her, I could see why he went into his chosen field. There was genuine care and concern for this diminutive patient. I was so grateful he was her doctor. Marcie now was now consuming not only the eggs, but dry cereal and Zupreem. Her muscle strength was increasing; she was able to pull herself up and climb on toys, even with the deformed front toes. Her weight remained stable at 76-78 grams. Her body mass, however, told another story. The breast muscle was more developed, and the keel was not so pronounced. Her body was becoming more normal in every way. By the end of May, there was little improvement in her underwing tissue. I assumed it just needed more time. Other than that, she was doing remarkably well. Her stood up straight, not hunched over as before, now that she has long tail feathers. And she was alert, sharp, and acutely aware of everything that was going on around the house. She was more tuned into the flock, too, letting me know when she wished to join them, especially at meantime and bedtime. 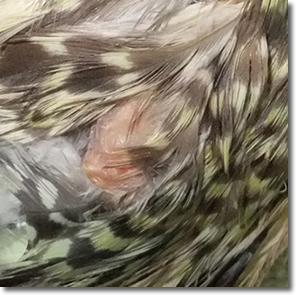 The xanthomas on her elbows had disappeared; the picture shows skin and bone that has not been covered by the feathers yet. Early in the month, Marcie’s feather coat began to go through a gradual but normal molt. The feather follicles had begun to generate feathers that were strong enough to force the older ones out, and they began coming in full-sized. The new wing feathers, particularly the primaries (longest wing feathers), appeared mature, and of an impressive size. Another huge step for her was that she was now able to balance herself so well that we no longer felt the need to place her in the bin to sleep. She was quite happy about that! The tacky, sticky fluid continued to gather under the right wing. Dr. Bob informed me about a product that might help her—ginseng. It is touted as a natural, herbal remedy for cholesterol build-up. “Ginseng has a bitter taste,” he said, “I don’t know if she’ll accept it.” I decided to suspend it in the Emeraid to make it more palatable. We hoped the ginseng would eventually resolve the issue. Natural remedies often take a long time to work. Now, at the end of June, Marcie’s transformation to a functioning, normal, healthy bird is nearly complete. The ginseng seems to be working; although it is really difficult to know for sure. Her wing tissue is healing and that’s all that matters. She knows her name and responds to it. Her appetite is excellent, and I’m certain it won’t be long before she samples other nutritious foods. She plays nearly all the time, and is making friends among the flock. She’s healthy enough to begin generating hormones, and the male ‘tiels are noticing it! Her wing muscles are stronger; she tries to fly, but her wings fail her. We are working on that. She still enjoys our snuggle time, but often cuts it short to attend to other activities. People have expressed to me that she is a very lucky bird. True, but we consider ourselves the fortunate ones to have had the opportunity to give her back her life. Compare the picture to the left with ones at the top of the article. It’s hard to believe it’s the same bird. This has been by far the most daunting yet rewarding avian experience I have ever encountered. It has been truly gratifying to see this fragile bird progress from such a near-death state to being well and whole. She is so determined to live—her spirit indomitable, her body resilient. No matter how many impediments she must confront, she tenaciously overcomes them and perseveres. I am a realist; I knew it that it would likely take a full year for her to heal. Each setback had been a tangible reminder of how much we had accomplished, yet how far we still had to go. Her future is bright; we are confident our dear little “miracle bird” will eventually be completely healthy. No animal should have to suffer what she has had to endure. She now has a forever home. 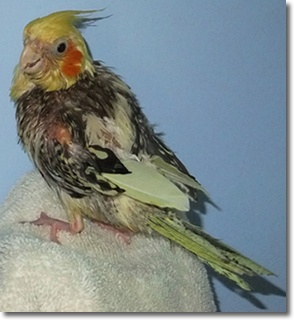 Rescuing and rehabilitating a bird is not for everyone. When people saw her in the first few months after I took her in, they were in shock. Her appearance was indeed distressing. But I didn’t perceive her in that way—perhaps I had become accustomed to her appearance due to the time I’d spent caring for her and the minute improvements I’d seen. Or maybe I foresaw her a year later. Then again, it’s more plausible that I had been viewing her through the eyes of love. I only volunteered at that shelter for four months, due to the conditions of the place and the stresses of dealing with the owner. Nonetheless, I’ll never regret it. I was there at a fortuitous moment. It is as though our meeting were providential. I’m convinced I was destined to adopt Marcie and two other cockatiels from that shelter. Fate plays a part in our lives--sometimes undeniably so. The next time you “just happen” to be in a similar position, near a bird that desperately needs you, consider the possibility that you are supposed to be there. You could walk away, dismissing this poor creature as unimportant, thinking someone else will take care of it, but maybe you are the “someone else” it needs. Those are golden opportunities we cannot ignore. Take advantage of them. We cannot dismiss these forsaken beings. They are the charges we are given in this life. You will be much the richer for it. As I bring this journal to a close, I wish to thank Sibylle Faye for permitting me to place it on her website. She has been most supportive of my journal and Marcie’s care from the beginning. Thanks also to Terry, my husband, for his support throughout this entire undertaking. His assistance enabled me to have the time I needed to work with Marcie. I would not have been able to do this without him. None of the success I’ve had with Marcie would have been attainable were it not for Dr. Robert Dahlhausen. His skill, expertise and knowledge have carried us through each and every medical adversity we encountered during this past year. His concern for her well-being has been constant, his attention to her needs unceasing, and his perseverance unfailing. I am extremely grateful to him for all the time and energy he has expended on her healing. I am indebted to him for his commitment to her—and all our birds’—health. She could not have been in better hands. Were it not for him, Marcie’s recovery would have been unachievable. Thank you, Dr. Bob. 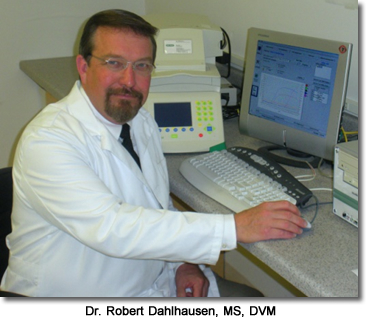 Dr. Dahlhausen was awarded the Lafeber Avian Practitioner Award in 2008 and has practiced avian and exotic animal medicine exclusively for nearly 30 years. 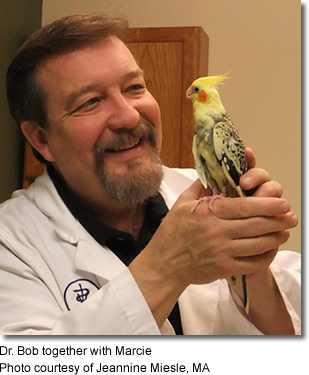 His current practice is the Avian and Exotic Animal Medical Center in Milford, Ohio. It is his research into the Avian Borna Virus and Proventricular Dilation Disease that has led to the use of COX-2 Inhibitors in the management of PDD-affected birds. He was the first to use the NSAID, Celebrex, in the treatment protocol of this disease. 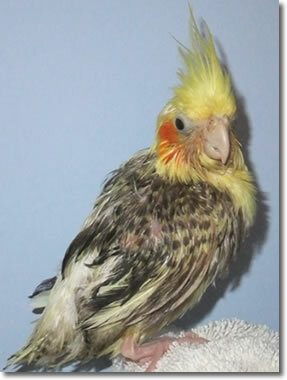 Many birds owe their remission from the signs of PDD to him. A brilliant diagnostician, surgeon and researcher, he is always available to his clients and values each patient. He has lectured worldwide on many occasions and is held in the highest esteem by his colleagues, the veterinary community, and his clientele.